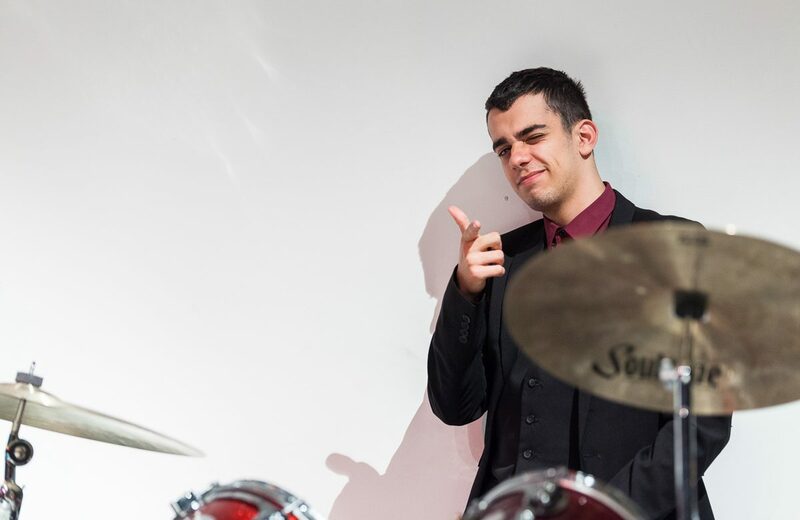 Michael Teixeira Henriques is an 18-year-old drummer with wisdom far beyond his years. When you hear him talk, you remember that maybe life isn’t as complicated as we make it out to be. With a bit of self-expression, self-care, and resilience, we can find the strength to look after ourselves while inspiring others. Okay, are we ready? We’re recording. How are you going? Top notch, how are you? Okay, can you please introduce yourself? My name is Michael Teixeira Henriques, I am Portuguese, and I am the drummer from To Be Honest. Amazing. So, when and where were you born? I was born in … don’t remember the hospital, but a hospital. Some private hospital that’s been shut down now. In New South Wales. Oh, suburb, sorry [laughs]. Woops! Um, suburb, I’m not sure. You kind of mumbled that one. So, could you describe the place where you spent your childhood? I spent my childhood in my home. That’s the one that I’m still in now, which is in Punchbowl. So, you lived in a house? Yep, lived in a house. Now I’m living in a house, from when I was a newborn till I was around one [year-old], I lived in Dulwich Hill in a little apartment. Okay, so you live in a house. Who do you live in the house with? I live with my mum, my dad, and my two sisters. Okay beautiful. So can you describe one significant memory from your childhood? Um, it would probably be … the first time I tried, um, a Portuguese drink called Sumol. Oh really? What’s the drink like? So it’s a fizzy drink which is really big in Portugal. Um, yeah, so it comes in many flavours and it’s really just super yummy. And bad for your health. Okay, when did you try it and is there a story behind it, or … ? Um, so growing up my family always went to Dulwich Hill and Petersham, very Portuguese areas. And they always had, like, Portuguese drinks and cereals there. And there was this one time my mum got a bottle of the pineapple flavour, and she was like, ‘This is so yum and it’s from my town, it’s so amazing’. So she poured me and my sisters a cup, we drank it, and now we’re addicted. Amazing. So would you say that’s one taste that, if you taste it, it would remind you of your childhood? So, besides that, can you remember an object or something that also takes you back to your childhood? Um, probably, uh … my childhood toy, which was a stuffed dog. Cute. So what about it reminds you? So, that was a gift from my grandma, [from] before I can even really remember. And then I have many memories of it because my sister — the youngest one, which is Olivia, she’s a year younger than me — she always said it was hers. I was like, ‘Uh, no it’s not, it’s mine’. So she threw it onto the roof, and, yeah. And did you end up getting it back? Oh, yeah, some guy was cleaning the gutters and was like, ‘Whoa!’, and threw it down. That’s actually so funny. So, do you still live in Punchbowl? Awesome. Would you say that Punchbowl is a place that feels like home? Yeah, uh, I’ll definitely say that. What about Punchbowl feels like home? I just think it’s very familiar to me. I know where essentially everything is. Yeah. You said you were Portuguese. Have you ever been to Portugal? Interesting. So, do you think if you ever visited Portugal, do you think that would feel like home? I wouldn’t say that. I was born in Australia, I was raised in Australia, Australia is my home. Awesome. So, looking back to when you were younger again. What dreams did you have for — so now you’re, like, 17-18 — when you were younger, what did you think or what did you want for yourself at 18? Um, so I always wanted a home. Like, just a house. But as soon as I hit, you know, ten, I was like, ‘You can’t get property until way later’. And there’s all the issues now, you’ll probably never get a house. Anyway, but I always wanted a happy life for me and my family. Um, yeah. And to finish school. Awesome. So, how achievable did you feel your dreams were? Did you think you were gonna get them or did you think they were so far from possibility? I feel like [with] finishing school and stuff, at the times when I thought about finishing school, it was so far away. Did you ever think you were gonna finish school? Um, I never liked school. I never enjoyed it. I enjoyed the people and some things in there, but I always thought, you know, ‘Finish this and get to Uni, and do what you wanna do’. Okay. So what dreams do you have for your future now? I really want to finish school, go to Uni, and, um … get a Bachelor’s Degree in Music. I think music, um … music is just a great way to connect everyone. Every culture listens to a certain type of music. There’s no culture, or there’s no one person, who doesn’t listen to music in some shape or form. That’s definitely true. So what about music interests you? You said you played drums, is that the instrument that you focus on? Yep, that’s the instrument that really got me into the ‘music world’. There was a stage when I was younger when my mum got me and my sisters guitars to learn. But I had no interest in that. Okay, so, got a deep question. Okay. What does strength mean to you? Strength? To me? Hmm, let me think about that. I’ll say strength has gotta be, like, resilience. Never giving up, always striving for your goals. Amazing. So, can you think of an image in your mind, an experience that you’ve seen someone go through, or yourself go through, that exemplifies the idea of resilience? Yeah, I get it [laughs]. [laughs] So, she, yeah. Started talking to her and then I asked her out, and she said yeah. That’s actually so awesome. I wish I had that confidence when I was that age. So, how did you turn that experience into a personal strength? Like, looking back, what about it makes you think of strength and resilience? There was definitely the part where she pushed herself away from me and stuff like that, and it was the whole ‘no talking’ and stuff. But then when I was like, ‘No, I’m not gonna give up on this’. So, when I forced her to talk to me, that was like, I wasn’t giving up now. Yeah. That’s actually really interesting. And I think we spoke about it a bit before, but what would you say would have been the worst possible outcome, and how do you think you would have grown from that? I think the worst possible outcome from that whole girl situation would be her dying. Like, that’s pretty bad [laughs]. But in a more literal sense, it would be her saying her saying no. But, um … you know, there’s no real thing such as failure. If you fail, you learn, you try again. Well maybe not with the same things, but you know. You learn from your mistakes. Beautiful. So, another big question. Okay. So what is one quality that you love about yourself? I think one quality that I love about myself is that I can — I can jive with people. I can, you know — I work well with others, and I’m a very social guy. Actually really great. When I was younger, I felt like I was socially awkward as a teenager. So I just admire teenagers that have that confidence so much. So, another big question. What does freedom mean to you? And how do you express that idea of freedom? Um, freedom to me is having the power and the freedom to do what you like, what you want to do in life. And having the resources to do what you want in life. For me, my freedom is, you know, playing the drums. And then … I guess playing it until night, you know? Really just doing what I want to do, then and there. That’s beautiful. So, if you could go back in time, give your younger self — maybe 12-13, that’s an awkward age — if you could give your 12-year-old self one piece of advice, what would that be? Probably … pick up the drums earlier. Well, we can either take this in the literal sense, as like, ‘Learn the drums earlier, get even better now’, or it could be trying new things. You know? Cos I never thought of the drums the way I think now, or even when I was around 14-15 when I started playing the drums. I never thought of the drums the way I do now. How do you think of the drums now? I think it’s … it’s a way to express. I feel like all music is just a way to express. Through singing, through dance. Oh, dance, that’s not music. But, you know. Through anything you love, you can make it about expression. Definitely. So, how do you think you could help others recognise their inner strength? Cos you said your ideas of strength are resilience, and you bouncing back and doing things that you’ve never done before. So how do you think you can help others to recognise that? Big question. Yeah, I know. You didn’t ask if I was ready for that one [laughs]. Um … I think a way to help others is to help yourself first. And since, I guess I’ve helped myself already, I think it’s just telling people about your life experiences. Tell them about, uh, examples of strength you’ve gone through. And I think through that inspiration type of thing, they can see themselves in a position like that. And then they’ll think, ‘Oh, what did that cool guy Michael say about strength? Oh, that’s right, it’s about never giving in. Resilience, never backing down’. And then they’ll do something they wanna do. That’s very, very lovely to hear. And that’s all for today, peace out.